Change ultimately, at least, brings with it a renewed sense of hope. Fortunately, at least one viable way we can change and exert control is to spend more time in the kitchen preparing wholesome meals that can nourish both our body and our creative spirit. We can make shopping and cooking an adventure; we can make a conscious effort to read food labels and make better choices; we can tap into the glories of a local farmer’s market or CSA; and, we can explore ways to cut back on our consumption of sugar. Because sugar fosters depression and anxiety, suppresses the immune system, and leads to a host of acute and chronic diseases, if we do little else to help ourselves in today’s world, thinking of ways to cut back on sugar can help us feel better and improve our health. What motivates us to change? Maybe a medical condition forces us to cut out or cut back on sugar. Maybe, because carbohydrate and sugar tolerance decreases with age, we just sense we now need to. Or, maybe, feeling sick or not quite ourselves, we think to cut back on sugar as we search for strategies that might bring us better health. Of course, everyone changes at their own pace and in their own unique ways. Sometimes we might attempt a “cold turkey” approach. It brings certainty and can be reassuring. Last October in response to my Excitoxins newsletter, a reader living in California wrote that she resolved overnight never again to touch diet sodas. I did the same with coffee three years ago after I fell down a flight of basement stairs and was hospitalized to have my shoulder rebuilt. Thinking that I would not feel the added pain of a caffeine withdrawal headache and wanting something positive at the end of the experience, I swore off coffee, a pleasure I had enjoyed and relied upon since my college days. My journey cutting back on sugar was very different. It was gradual and not even intended. Sugar was a big part of my life in my early years. A meal was defined by what was offered for dessert, with other foods on the plate serving simply as requirements on the way to the only item that mattered. It occurs to me that a good way to cut back on sugar is to change the way we think about it. In today’s world when sugar is cheap and readily available, does it still deserve a place in our hearts as a special “treat?” Certainly, to think of sugar as a treat made sense 200 years ago, when it was a rare and scarce commodity. But today, without a question, we put sugar in the center of our daily life and celebrations, in the form of cakes, cookies, pies and ice cream to highlight the birthday party, the wedding, or the holiday feast. Rampant diabetes and other chronic disease can help us see sugar as a cheap commodity that does nothing to enhance our health and emotional well-being. This realization was the impetus to my own change. As a child I spent every available nickel on candy. Now, I far prefer the taste of farm-fresh whole foods. To me, the rich custard-smoothness of a freshly-baked sweet potato oven roasted in its own skin beats a Snickers bar, any day. Sugar is fragmented. It creates imbalance that can set off cravings and binges, as well as acute and chronic disease. (See April09 newsletter) I believe the road to cutting back on sugar, and it can be a gradual one, starts with a shift in perception, followed through with intention and awareness. Awareness means simply paying attention to how you feel. Whatever your reasons to think of cutting back on sugar (and I trust you are since you have read this far), I set out in this newsletter to give you tools to decode your sugar cravings, to make substitutions, and to have fun in the kitchen along the way. Life is motion. Ironically, we stay balanced and centered only by motion. Life is never static. A biker stays upright and balanced only by forward motion and by constant subtle adjustments with the handle bars. Likewise, in a world ruled by polar forces of energy, we are always trying to right ourselves. Only by constant efforts to select, move, and adjust are we able to seek balance and “centeredness.” We eat a meal and are full. Pretty soon we are hungry again. We sleep and are renewed, but by nighttime we are again ready for the refreshment that sleep can bring. Stress creates imbalance and so does exercise. Stress is contractive and makes us crave expansive sugary foods. Exercise makes us feel good when it generates endorphins, but it is also acidic and requires alkalizing antidotes in the form of deep breathing and alkalizing foods. Even a meal of substantial calories, protein, fats, and carbohydrates that looks satisfying and balanced to the Western mind might set off wild cravings for sugar. Take, for example, a dinner of roasted chicken, sautéed carrots, green beans, whole wheat bread and butter, and a lemon tart for dessert (all Wood Phase). Even such a major meal can send us in search of sweets (Earth). Lifestyle model, of key importance, particularly as it relates to stress and sleep, chewing our food and paying attention to how different foods make us feel. It also includes having a life passion filled with meaningful work, a sense of gratitude and a spiritual component to living. We can best decode sugar cravings when we take the time to become familiar with these models. Over time, they begin to make sense. See the Resource Reading at the conclusion. Metabolic stress. Another consideration is blood sugar levels. Because carbohydrate and protein metabolism are inter-related, when we eat a lot of sugar and other concentrated sweets, our body needs to be anchored by additional concentrated animal protein and fats in order to stabilize blood sugar. Have you ever noticed how much better you feel when you pair a glass of wine (an expansive sugar) with adequate protein and fats to avoid a hangover? For our body, might it not be much the same with sugar? We need protein and fats as a balancing buffer. Unlike alcohol, our body does not react to sugar with the same hangover warning, but the imbalance is there nonetheless, through a surge in insulin, along with dehydration, depletion,4 and cravings. Foods and cooking strategies offer vast opportunities to alter our energy, our focus, and our moods. We can take corn, an expansive grain, as illustrated below. Corn itself might make us a little on the “spacey” side. But, if we then grind it and deep fry it into a chip, we can transform it into a more yang, contracted source of energy (see cooking section, below) that can perk our adrenals and help us focus for concentrated work at our desk. During my years at home as a mother of young children, it suited me well to be mostly vegetarian, eating a lot of beans, grains, and vegetables. Eating near the “fulcrum” of the yin/yang continuum, I enjoyed a more passive, centered, calming, “soft” kind of energy. In contrast, people working in stressful jobs that require high levels of sustained energy often find balance by eating a lot of meat (yang) and then balancing this with sugar and alcohol (yin). Eating at the polar extremes like this can work well for a “Samurai” competitive life style. 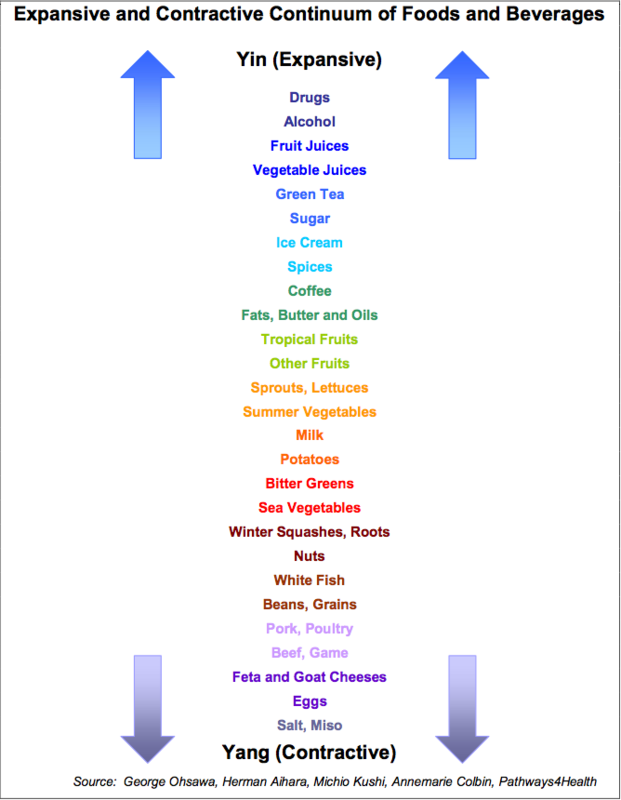 Acid/alkaline refers to the type of residue left in the body after a food is metabolized. The key idea is to consume plenty of fruits and vegetables that are loaded with minerals to offset the demineralizing effects of consuming acid-forming foods like sugar, refined carbohydrates and animal proteins. This model helps explain why we like to put salt (contractive) on eggs (also contractive) because helps alkalize the natural acid-forming effects of eggs. Likewise, we enjoy the alkalizing effects of coffee when we eat a sugary dessert. The Acid/Alkaline Model add another dimension to unraveling the mysteries of sugar cravings. Annemarie Colbin, Food and Healing; Book of Whole Meals; Natural Gourmet. Paul Pitchford, Healing With Whole Foods. Elson Haas, Staying Healthy With the Seasons, Staying Healthy With Nutrition. John Garvy, Jr. The Five Phases of Food. Steve Gagne, The Energetics of Food. Daverick Leggett, Recipes for Self-Healing. Evelyn Roehl, Whole Food Facts.